Soname was born in the harsh Tibetan countryside during the Chinese occupation. 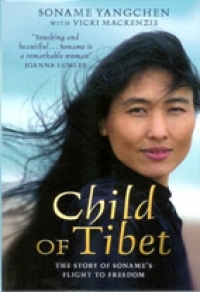 Of noble descent, she had to endure a childhood in servitude in Lhasa, separated from her family and the world she loved. When she was just sixteen Soname risked death in a freedom trek across the Himalayas, finally arriving in Dharamsala, home in exile of the Dalai Lama. Even after managing to escape from Tibet, she faced further dangers and heartache in India, being forced by destitution to give her daughter away. Soname later managed to reach England, where she met and married an Englishman and came to live in Brighton. Her hidden talent was discovered when she sang a traditional Tibetan song at a wedding reception, unaware that a member of a famous band was a guest. Concerts followed. Tracing her long-lost daughter has long been Soname’s preoccupation, and it is hoped that her daughter will finally join her in England later this year. Soname is a striking, funny and unsentimental woman. Hers is a story of immense will, unbelievable courage and, above all, an indomitable soaring free spirit.